I need to stay positive, upbeat and clear-headed. I can’t let the kids behavior pull me into frustration, although it does happen. I want to share with you what I came up with to stay focused on the positive no matter the challenges of the day as a stay-at-home mom. Lately, I have needed a little pick-me-up in the afternoon. It is the time of day right before dinner when I think self-control starts to leave my children’s bodies. They start to get impatient with each other and argue a bit more. Trying to juggle dinner, homework time, and toddler meltdowns inspired me to find a fix. My idea to be creative didn’t happen. Life left little time for craftiness and artwork, but the need to motivate myself in a moment of struggle was still needed. I wanted to create a way to inspire myself, to stay positive for me and my family. I did and now I want to share it with you. I decided to put together some of my favorite motivational quotes that I have created and shared over on The Stay-at-Home Mom Survival Guide Facebook page. I printed them out and displayed them around my home as little pieces of motivation for me. I need to give myself a break in the rough moments. Our day starts early in the morning, goes all day and often into the night. I have to keep myself positive. This is working. I put the quotes together for you too with the hope that they can inspire you, keep you positive in the tough moments, or just help you start your day with a joyful outlook. The only catch to this freebie is you have to subscribe to my free weekly newsletter to receive access to the subscriber-only page. It is a way for me to say thank you to those of you who subscribe, read along and share the ideas you find here with other moms. No stay-at-home mom needs to think her time at home is worthless. It is worth it to be a stay-at-home mom, and I make it my mission to be sure stay-at-home moms know that! I recently read a blog post with creative ways to write truth around the house. 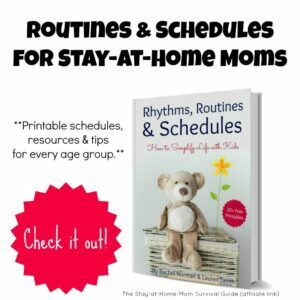 I already had this subscriber freebie planned, but I wanted to be sure I shared the link to that post too because it is so helpful for moms. 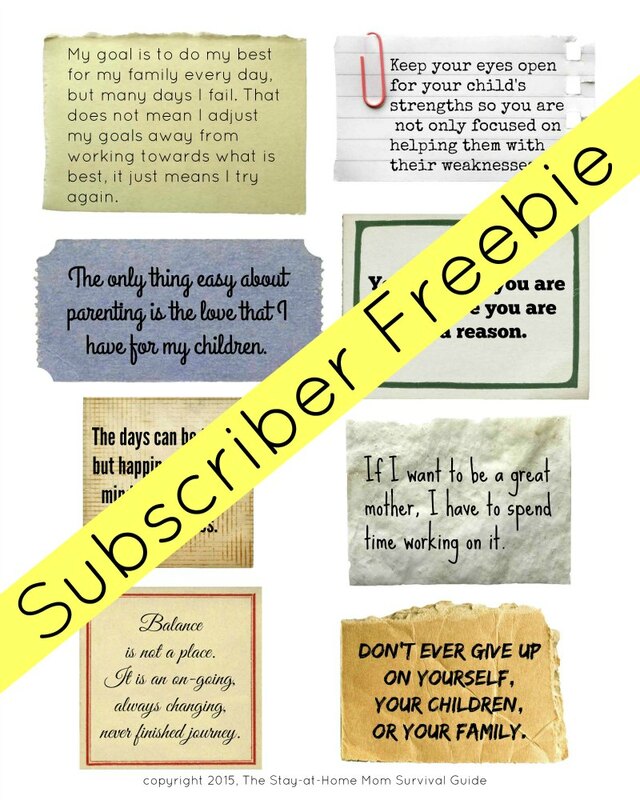 You can take the free mom motivation quotes I am offering you and create your own artwork from them, or simply cut them apart and display them in places where they will catch your eye at just the needed time-like I did in my home. Place these in spots around the house where you often find yourself feeling worn down or frustrated. I put one near the door for when we are getting ready to leave in the morning (it can be stressful some days). Another spot is your child’s room-the twins still wake up at night, so I placed one on the wall of their room to remind me not to give up or get overwhelmed. It might seem like a small thing to place these around your house. Maybe it will be uncomfortable for you to have others see them. If so, place them in your nightstand and glance at them before you go to bed or right when you wake up. Place them in your car. The inside of the kitchen cupboard works too. You don’t have to display them all, but maybe one or two will keep you focused on the fact that doing what you do does matter every day-we don’t get this time with our children returned to us. One of the best things about posting these around the house was my oldest son started noticing them and reading them out loud. I love that he is reading this inspiration and I get to talk about why it is on the wall. My children learn how I handle stress, so if they can see that this strategy to stay positive works, and use it as they grow, I have helped them while helping myself! To download your own copy of the Mom Motivation Focus cards, subscribe (totally free) to the Survival Guide newsletter. It comes from me every Sunday evening and will always have the week’s dose of mom motivation ready for you when you choose to receive all updates to the blog via email. 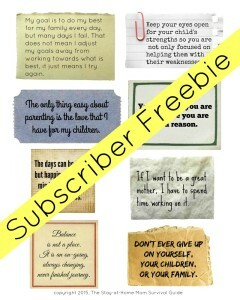 I hope these mom motivation quotes focus cards will be an easy way to motivate yourself, to care for you! If you are already a newsletter subscriber, I emailed you the info to access the subscriber freebie page. What is your favorite motivational quote for moms? 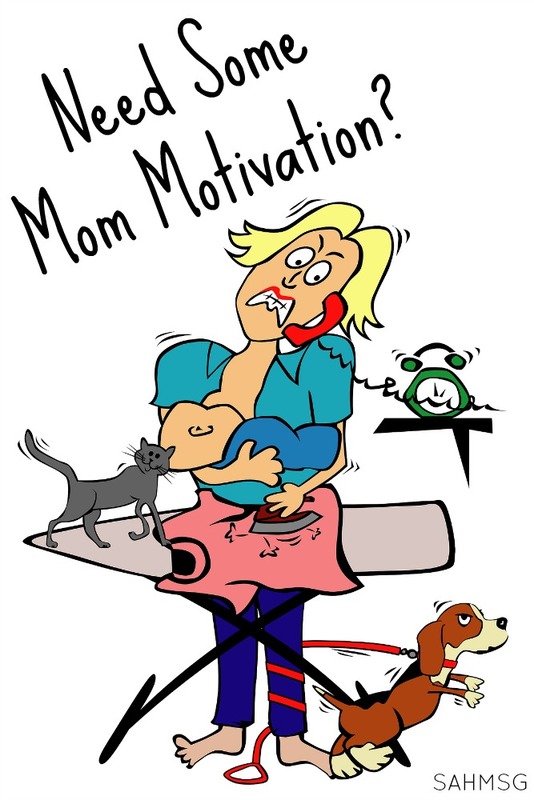 Catch up on all the motivation for moms!